The general price for skydiving throughout the United States is usually around the $200 range. This can vary in some markets from $150 through $250, but the most common price is $200 to an altitude of 13,500 feet not including video services. It’s important to note that not all skydiving experiences are the same. There are several factors to take into account before booking your jump. These factors include the airplane type the skydiving center uses, the exit altitude and the operation’s reputation for both safety and customer service. A good rule of thumb is to do your research. The most common error consumers make when purchasing a skydive is to make their decisions based on price. Cheapest isn’t always best. Skydiving involves the use of expensive equipment such as airplanes and parachute equipment – both of which are costly to attain and maintain. Like selecting a heart surgeon, you want the most qualified, not the least expensive as skydiving is an activity that has a risk quotient that has the potential for injury or death (something we take very seriously). Be sure that the altitudes are well stated when purchasing your skydive. There’s a big difference between a 10,000′ jump and a 13,500′ jump. While 10,000 feet is high, the free fall time is nearly 30 seconds shorter than that of a jump to 13,500 feet. If you’re looking to have the ultimate experience, altitude is definitely something to consider as the experience goes by very quickly. *Buyer Beware: Watch out for skydiving centers that use the term “up to.” This is a grey area term used by some skydiving centers who don’t usually fly to the advertised altitude in order to cut on fuel costs. Know your aircraft! The backbone of the skydiving industry has always been the Cessna 182. It’s a workhorse, but it has its limitations for both space and altitude. The 182 aircraft holds four passengers plus the pilot. This can be restrictive if you’re wishing to jump with a group as only two tandem pairs can go up at any one time. The exit altitude won’t be more than 10,000 feet and it’s a little bit tight on space. 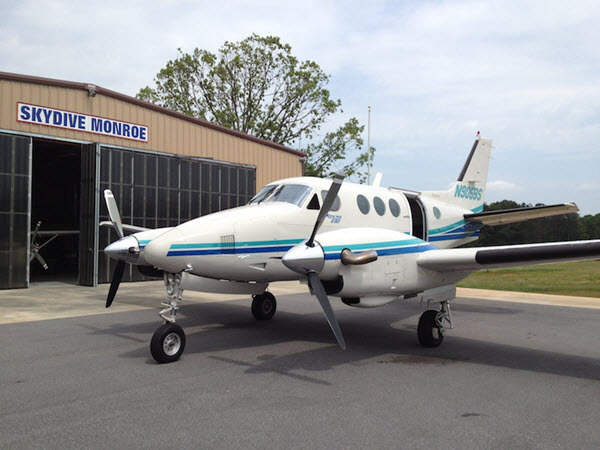 For the ultimate experience, look for a skydiving center that uses a Cessna Grand Caravan, King Air (this is the aircraft type we use) or a Twin Otter. These planes can take groups and fly to 13,500 feet fairly quickly. A fine dining experience can be soured if the service is poor. The same holds true for a skydiving center. While skydiving is a thrilling experience, some high volume skydiving centers are not unlike an amusement park whereby it’s about getting people through the turnstiles as quickly as possible. This often leads to skydiving instructor burnout and a mediocre experience. It’s our view that skydiving is a momentous occasion in someone’s life and we want to celebrate your achievement with you! What’s The Cost To Go Skydiving in Atlanta? If you’re looking for skydiving near Atlanta, there are four primary skydiving centers. Below are their various prices broken down by weekday, weekend and group rates. Quick pro-tip when scouting out your place to skydive – beware of third-party operators! You will generally pay significantly more dealing with third-party operators as opposed to booking directly with a legitimate skydiving center. Within the skydiving industry, there is a well-known company that has built hundreds of websites throughout the US that try to portray themselves as legitimate skydiving centers. It’s a clever funnel to drive phone calls to a call center that will sell a reservation to a skydiving center that may be different than where the consumer actually thinks they’ll be skydiving. Presently, there is a lawsuit pending by the Attorney General of Georgia against one of these companies – you can learn about it here. When doing your homework, be sure to verify a facility’s physical address and that it’s at an airport. Skydiving centers that show their locations in downtown areas should be scrutinized. Additionally, be sure you can locate a price on the company’s website and that you have the ability to book online or speak with someone directly at the physical location. If unsure, ask the individual if they’re speaking with you from a call center – this should raise a red flag. When selecting a restaurant, it’s standard to read reviews on Google, Facebook or TripAdvisor – you should do the same for the skydiving center you’re doing research about. The overall review score will give you a glimpse into what you’re buying. Call us! It’s our goal that you have the best skydiving experience possible (whether it be with us or someone else). We’re happy to answer any of your questions about skydiving or the industry in general. What Does It Feel Like, First-Time Skydiving?